Finding the best toys for 6 year old girls is going to be easy for me this year. Why? Because that is how old my own daughter is. Her wish list grows daily. It seems that every commercial she sees just adds to it. I’m really beginning to dislike television and youtube! But, her exposure to all of the advertisements has enlightened me to many new products available. So it has given me plenty (and I do mean PLENTY!) of toys to research. It is the best way to discover what toys will be a good fit for her, as well as my reader’s little girls. Topping our little princess’ wish list is many of the toys I’m sure your little girl is asking for too. Shopkins, Ever After High Dolls, Little Live Pets, a Kidizoom watch and art toys have been mentioned on a lot in our house, and probably yours too. 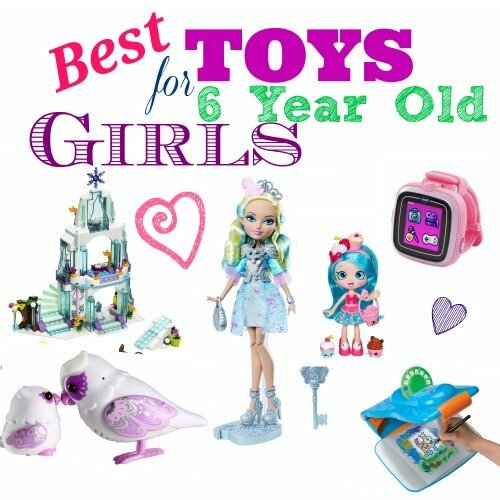 Read on to find what I learned about each of the wish list toys for 6 year old girls. Doll Toys for 6 year old girls are still just as popular as when we were kids. Little girls just love to pretend play with all kinds of dolls. From Barbie, to the new Ever After High and realistic acting Baby dolls. Here are a few of our favorites that have been asked for by our resident 6 year old toy expert, Sammie. Ever After High Dolls have truly captured the attention of my little princess fanatic. She wasn’t thrilled with the Monster High series – she doesn’t like ‘scary’ things. But when she caught sight of Darling Charming and Rosabella Beauty, and even the twins Poppy and Holly O’Hair, she was hooked. Ever After High Dolls are the teenage children of all of our classic fairy tale favorites. Darling Charming is the daughter of King Charming. Rosabella Beauty is the is the daughter of Beauty and the Beast. Then there are the twins Poppy and Holly O’Hair. They are the daughters of Rapunzel. There are many more characters, from just about every fairy tale you’ve ever read. You can pick and choose your favorites from those found on Amazon.com. Some of Sammie’s chosen favorites are below. Vtech Flipsies are new to the little interactive play sets and dolls market. They look very cute. Plus, with the technology implemented they will make sure your little girl stays actively engaged in her pretend play. There are a lot of different themed Flipsies play sets. Most come with one doll figure and accessories, with more available separately. The price point on these is not going to break the bank, and they look like fun. You can view more of the available sets by visiting this Flipsies page on Amazon.com. Shopkins have been huge in our house for about a year now. Sammie has built up quite a collection of the tiny little Shopkins toy figures. Yet now for Christmas she is asking for “a case” of them! I don’t know if she will get ‘a case’ but she will definitely be getting some additions to her collection. I’ve had my eye on the new Shopkins Shoppies Dolls that have recently been released. She can’t wait to get her hands on them too. Disney’s Frozen Fever Elsa Doll hit the radar after we took our daughter to see the Live Action version of Cinderella this summer. Frozen Fever was a short animated movie. It was played before the feature film. Elsa plans a birthday party for Anna. Then Elsa has a cold. She’s stuffy and miserable but still wants to make her little sister’s birthday special. It was a really cute little story, and only left Sammie anticipating the release of the full length sequel to Frozen that is expected to be released some time next year. We already have several of the Anna and Elsa toys. From the large plush singing Elsa to the Barbie sized Anna & Elsa dolls, and even the small magic clip dress dolls. Yes, even the complete little figure set from the Disney store has found its way to our house. So, one more addition to the Frozen collection is always welcome. This doll stands approximately 12 inches tall ( about the size of a Barbie) and comes with the pretty spring themed dress like she wears in the Frozen Fever film. We will probably be getting the Disney Frozen Fever Anna Doll as well. American Girl Dolls are just adorable! I love them! I especially like the way they come with a story book. Little girls get to put a personality with their little ‘friend‘. I’m not sure that our Sammie is quite ready for a doll like this – but I love it and may get it just for the collectible nature of it. American Girl Dolls are beautifully made, and stand about 18 inches tall. Little girls can dress them up in different outfits and you can even buy clothes for your little girl that will match her ‘mini me’ doll. Of course I was thrilled that this Samantha Doll closely resembles my own Samantha, so this would be the one I would choose. There are many more styles and even those that can be selected to closely match the appearance of your little girl. They are on the expensive side, so not something for a child who doesn’t take care of her toys, but so precious! I may start out with the American Girl Mini Doll, which is a smaller version of the large dolls – just to see how well my little Sammie can treat her. We’ve been eyeing a lot of larger dollhouses for Sammie. She has about outgrown the Fisher-Price My First Dollhouse. She has had the toddler dollhouse since she was about 18 mos. old. I love the Barbie Dream House shown at right. My husband thinks he wants to go with a wooden dollhouse like the Kidcraft models below. Which do you think your little girl would like? Sammie has had a lot of fun with the old one. Now that she has a lot more Barbie and Disney Princess dolls that are just too big to fit in the Fisher-Price one. We haven’t decided just yet, and this is something we will be buying closer to Christmas. A big house like this will be much harder to hide something this big until Santa is due. Both the Barbie Dream House and the Kidcraft ones have lots of furniture for the rooms. Some pieces even have the ability to light up or make sounds. (Barbie’s toilet flushes! LOL!) Which I think will really add to the ‘realism’ of her pretend play with all of her favorite dolls. My 6 year old daughter is nuts about everything Frozen. From puzzles to dolls, and anything else she sees! I knew this LEGO version of Elsa’s Ice Castle was sure to be on her Christmas Wish List. She loves building things too. Now we don’t have any LEGO sets yet, (we did have the larger Duplo blocks when she was younger) I was really leery of the little pieces. Not to mention the fact that she really has a bad habit of leaving toys everywhere. I’m sure we’ve all stepped on a LEGO in bare feet in the middle of the night right? OW! She’s a bit older now, and I think this set is absolutely adorable, and a perfect introduction to LEGO for her. This set has 292 pieces and includes the LEGO minifigures of Elsa, Anna and Olaf. I may wait until next year for this set, but it is definitely on the radar. After all, I love everything Frozen too! LEGO toys aren’t the only building toys for girls that are about 6 years old, in fact there are a lot of choices that girls will love! Here are a few more choices that are highly rated and promote many developmental skills – plus they are just plain FUN! There are a lot of different animals to choose from, but our Sammie really likes the Puppies and Kittens because they are cute and snuggly and she can’t have pets in the house due to allergies. Little Live Pets are pretty popular right now, and even have other pets now too like the Little Live Pets Dragon , Little Live Pet Turtle that actually swims, the Little Live Pet Hedgehog , and even a Little Live Pet Mouse. The Vtech Kidizoom Watch has been on Sammie’s wish list for a while now, I was going to get it for her birthday, but she got another watch from her grandmother and I didn’t want to take away from that gift. So I waited. I’m thinking for Christmas this year will be a good time to get it. When I was checking out all the details on this watch, I came across the bundle with the Vtech Action Camera , and now have the dilemma of whether to go with just the watch or get the bundle pack. I love that I can mount the action camera on her bike and she can take pictures while riding. The watch is pretty cool all by itself it’s big bold touch screen is made for kids so it is made to take a bit of a beating. It not only has 55 different clock faces for telling time though, it also has an alarm and a timer. The Kidizoom smart watch also has two cameras built into it, allowing them to take selfies, pictures and video with fun effects to make them silly or cute. There is also a voice recorder with silly voice-changing effects, and is pre-loaded with learning games they can play. ( I love that for them to play while in the car so they won’t make you crazy with “Are we there yet?”) – plus you can download more games and watch displays through VTech’ s Learning Lodge on their website. The watch is charged via a Micro USB which also allows transfer of videos and images to a computer. The Kidizoom watch is splash and sweat resistant but not meant to be submerged or taken into the shower or bath. It is not for swimming in just yet – but I bet there will be one … eventually. I’m definitely going for the watch. She can tell time already, this way maybe I can teach her to schedule herself. I would love to get her used to setting a routine. Good habits start early! This list will continue to grow as we get more suggestions and items added to our daughters wish list. Be sure to check back again to see what other cool toys Sammie wants!